To select or place a node, use the left mouse button. To deselect or delete a node, use the right mouse button (or ctrl+left mouse). To run the simulation, press [Space]. To restart the level, prees [R]. "Road parts" can only be built horizontally between the topmost supporting nodes. I do have a bit of space left. Any comments and suggestions are warmly appreciated! The characteristics of the building material is rather peculiar to say the least! I love this game - it's a very good simplification of Bridge Construction Set (pontifex 2). Scratch that - found a clean version that is much cheaper! Add some kind of mechanism for importing & exporting a bridge design to/from a hex string encoding so we can more easily share bridge designs. Renoria - I'm afraid it's rather hard to tell what goes wrong from that exception, but I'll make sure to upload a version with debug information enabled shortly. Abuse - I had seen a lot of cheap bridges already, but your $2047 takes the prize! 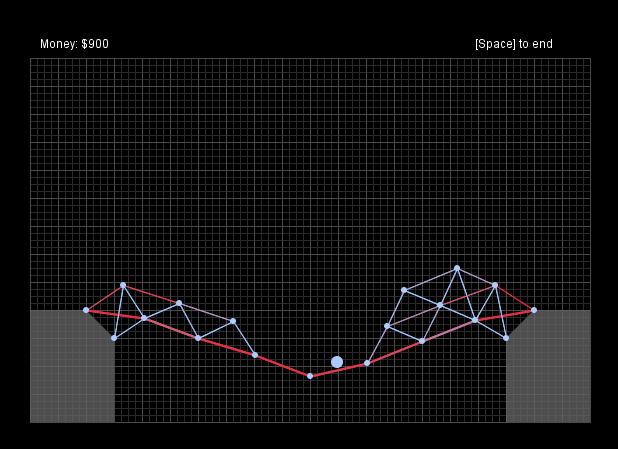 As for importing/exporting bridges: Sure, I could do that. The other option (which would quickly use up most remaining space) is adding levels of difficulty (different support setups, bridge lengths, starting money and ball weights). Which would you prefer? Finalize objects on finalization queue ... completed. Memory: 5,056K  Free: 623K  (12%) ... completed. Reload policy configuration ... completed. Sorry Renoria, hadn't uploaded new version yet. Try it now - should give line numbers when crashing this time (current debug version >4kb, not obfuscated). One Idea: The game can be played whole by mouse except for start or stop by using space. Would be great to make to top right text "clickable"
Another Idea: Allow deletion of edges as well as nodes. Currently if you create an edge between 2 of the starting nodes, the only way to get rid of it is to restart the app. This would also help when wanting to remove a single edge from a node that has many others. Currently you have to delete the edge, and re-add all but the unwanted edge. Updated. There are now levels in the game; they should get progressively harder. Every second and fourth level is a bit different from the standard layout, and the gap widens with each level. Also, the ball gets slightly heavier with each level. I've still not managed to get those physics more rigid, though (I should really start over, but I lack the motivation). Found a bug, if you rerun the simulation after you have been given the "level passed" message, the level counter is incremented again. I have two issues. Firstly, the grey stuff looks solid but if I place nodes against it they go through - pretty much forces you to build a suspension bridge because if you undergird it your girders are unanchored. Secondly, the mouse and key handling is dodgy. The impression I get is that in the event handling method you're storing whether the button/key is down or not in an array, and in a separate thread you're reading that array. I don't think you really care about drags, so I suggest only setting the boolean to true in the event thread and then clearing it in the logic loop. Abuse: Thanks. I'll fix the level counter bug. About very late levels (11 and the like): Yeah, you're right. I didn't think anybody would bother playing that far, but I've been meaning to put a cap on the gap width and instead decrease the amount of money available. 1) It's not meant to be solid ground; it's only decoration. I understand how it may feel odd if you haven't played a similar game before, though. The game mechanics are more or less taken from Pontifex II, in which you can only use a few "support nodes" as a base for your bridge. 2) I'm not sure what you mean about the input handling. I know it was previously buggy, but it really shouldn't be right now. What you suggested as a solution is how it's already being handled. Could you give me some specs for your machine, please? It may be that it's due to the program running slowly (although even that shouldn't really cause any troubles with the input handling). Odd. I have a 1.7 Ghz box with Debian testing and some version of Sun 1.6 Java - I think it was using 1.6u10, but I'm not certain and I'd probably have to write an app to print system properties and run it with Webstart from the browser to be completely certain. As I'm just about to go to bed, that won't happen tonight. The symptom I found was that I had to hold the button to get it to recognise the click. I'll look into it some more. I'm really impressed by this, the physics is much better than I would've expected in 4k. I also like your user interface - the circle showing how far an edge can reach is much more intuitive than most games, where you have to click and drag and hope you have room. Having the ball go across twice is a good design decision as well, since it prevents you from using a cheap bridge that falls apart as soon as the ball is through. Have you considered having levels where there's more than one ball going across at once? I've uploaded a new version. The physics simulation is still dodgy - I won't have time to fix that. However, I have fixed a few arbitrary bugs, improved level progression a bit (I hope), and improved UI usability some. I've also submitted the game to java4k.com, so it'll probably be there shortly. I might work on this some more, but it's unlikely that I'll make any major changes since I've started exchange studies in Australia. Thanks for all the feedback folks!